With a weather pattern to rival the Cote d'Azur with its own microclimate and almost 2,400 hours of annual sunshine, the Charente Maritime is the perfect place to holiday. The region is blessed in being just far enough away from the Pyrenees and yet far enough south with low lying geography that combines to give it an area with the highest number of average annual sunshine hours in France except for the Mediterranean. La Rochelle enjoys 2331 hours of sunshine a year on average (21.3% more than Biarritz in the south). As well as in high season, beautiful weather can be enjoyed in the months of April, May, June, September and October, so it's well worth considering a spring or autumn break. 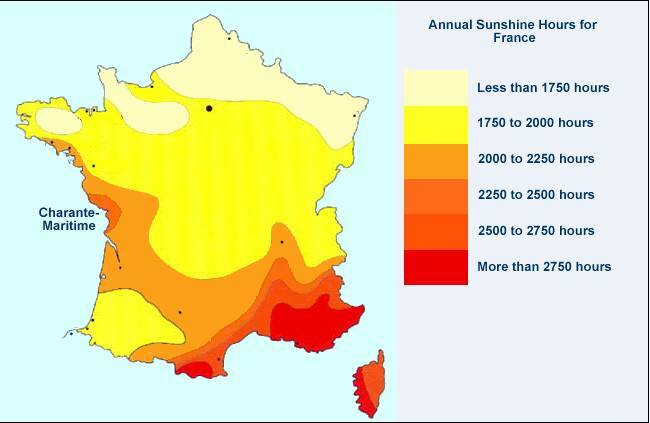 Below you will see an average hours of annual sunshine map for France.